The next exciting development in the regeneration of Galashiels is a step closer as work gets set to start on creating the Great Tapestry of Scotland visitor attraction. Stirling-based Ogilvie Construction has been appointed to build the landmark facility for the attraction, which tells the story of Scotland through one of the world’s largest tapestries created by 1,000 people from across the country. Work is expected to start in the coming weeks at the town centre site, which will be transformed with the creation of the new building. It has been designed by one of Scotland’s leading architectural practices, Page \ Park, with new images of what it is expected to look like now available. The visitor centre – which is accessible from Edinburgh in less than an hour via the Borders Railway - will have a wide range of interactive displays and activities. There will also be exhibitions and events for tourists and locals alike, as well as a gift shop, café with local and seasonal produce, and educational facilities for all age groups. The Great Tapestry of Scotland – which will be managed by charity Live Borders - will kickstart a new future for Galashiels, alongside a number of other projects which will provide a host of benefits for the town and the Scottish Borders. These include the new town trail which will include a sculpture dedicated to Galashiels sweet seller Robert Coltart who wrote the world famous children’s lullaby Coulter’s Candy (Ali Bali Bee). 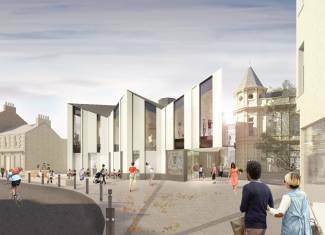 Significant improvements to the town centre are currently being taken forward in partnership with community groups, and a masterplan which aims to transform Galashiels and encourage investment in the wider Borders economy is being progressed. Ogilvie Construction has started work on Glasgow’s first YOTEL in a prime location on Argyle Street opposite the city’s Central Station. Ogilvie is transforming the Westergate building into a 256 room hotel that will be equipped with YOTEL’s signature design and technology-driven hospitality offering. The new hotel will feature Glasgow’s first destination rooftop bar complete with bowling alley. 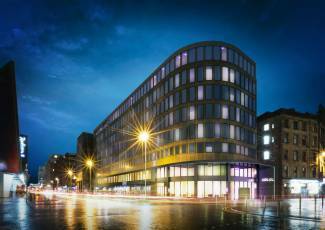 The new hotel is set to open for business in November 2019 and will be YOTEL’s second hotel in Scotland after Edinburgh and its fifth in the UK. Known for its seamless technology and cleverly designed spaces, YOTEL Glasgow’s cabins will feature the brand’s signature adjustable SmartBed™ as well as its smart TVs for guests to stream their own content. Ogilvie Construction is part of the Ogilvie Group, one of Scotland's most consistently successful family owned businesses. The company is over 65 years old and employs over 550 people across its various business operations. Inspired by the luxury of first-class travel and uncompromisingly designed around guests, YOTEL takes the essential elements of luxury hotels into smaller, smart spaces and deliver extraordinary value and a sense of community with areas for co-working, social gatherings and exercise in sought after locations. Premium Cabins include YOTEL’s signature adjustable SmartBed™ with rejuvenating rain showers and SMART TVs, multi power and USB points and easy connectivity. YOTEL currently operates four airport hotels in London Gatwick, London Heathrow, Amsterdam Schiphol and Paris, Charles de Gaulle and three city centre hotels in New York, Boston and Singapore. YOTEL is expanding rapidly with new projects under development globally, including Istanbul New Airport, San Francisco, Singapore Changi Airport, London, Edinburgh, Glasgow, Geneva, Amsterdam, Miami, Dubai, Mammoth, Park City, Porto and New York Long Island City. YOTEL’s major shareholders include a controlled affiliate of Starwood Capital Group, the Talal Jassim Al-Bahar Group, United Investment Portugal and Kuwait Real Estate Company (AQARAT). YOTEL was created by YO! founder Simon Woodroffe OBE, who inspired by first class travel, translated the language of luxury airline travel into a small but luxurious cabin (www.yo.co.uk). Visit www.yotel.com for more information. 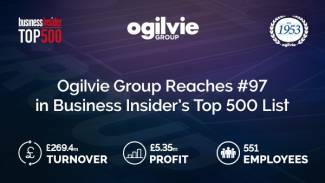 Ogilvie Group has moved up 6 places in Business Insider’s list of the Top 500 Scottish Companies. Now placed inside the top 100 at 97th place, the list is ranks businesses based on a number of factors including turnover, employee size and profit per employee. Ogilvie Construction will break ground this month on a new £4.5 million Travelodge in South Gyle, Edinburgh for developer Crucible Alba Group. The new 70 bedroom hotel is due to be completed in the Autumn and aims to attract tourists and business travellers taking advantage of its proximity to Edinburgh International Airport. It is located on a site purchased from Greene King and adjacent to a recently opened Farmhouse Inn. Ogilvie Construction is part of the Ogilvie Group, one of Scotland's most consistently successful family owned businesses. The company is over 65 years old and employs over 55 people across its various business operations. Ogilvie Construction's latest batch of vans have been delivered to Stirling and are now on the road construction sites across the UK. 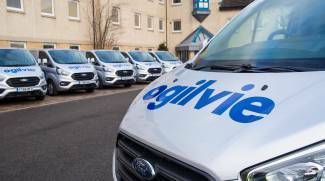 The 38 vans, made up of Ford Transit Customs, will be used to replace existing vans as well as allow to meet needs for current projects, have been leased via sister company Ogilvie Fleet. 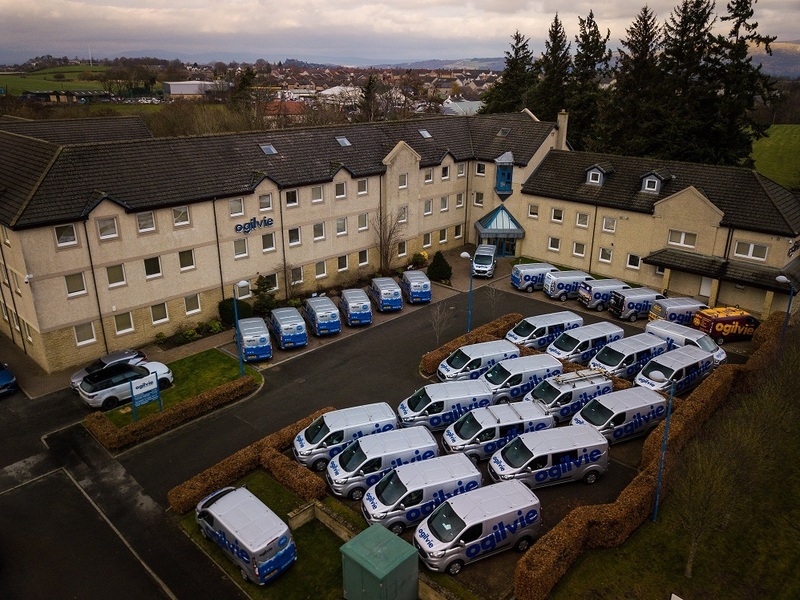 The vans have been fully branded by vehicle livery specialists Mediafleet, incorporating branding for each of the Ogilvie group companies - Ogilvie Fleet, Ogilvie Homes, Malcolm Hughes and Net Defence. 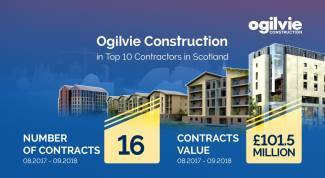 Ogilvie Construction have continued a strong second half of the year with a top 10 ranking in Glenigan's Top Contractors in Scotland league tables. Up from £92.4million, Ogilvie have have been awarded 16 contracts in the last year worth £101.5 million. The figures come on the back of projects awarded in the hotels, leisure and education sectors. 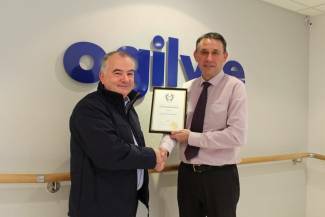 Ogilvie Group’s continued success has recently been recognised across a number of industry awards schemes and business league tables. 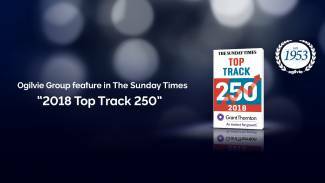 The Group reached its highest position ever in this year’s the Sunday Times Top Track 250, at 93rd. The league table ranks the UK’s private mid-market growth companies with the biggest sales. Ogilvie Fleet will be aiming for a hat trick next year after retaining the Leasing Company of the Year Award up to 25,000 vehicles at the annual awards from trade publication BusinessCar. It adds to the Best Daily Van Rental Award at the van Awards and the Top Vehicle Leasing and Fleet Management Company for Customer Service at the Experteye Awards that they picked up earlier in the year. Ogilvie Construction was ranked 58th in this year’s top 100 construction firms published in the Construction Index. It continues the construction business’ consistent strong performance, despite the changing market conditions. “Across the Group our businesses continue to make steady progress in their markets and we are delighted to see that recognised in industry awards and league tables. Ogilvie Group is one of Scotland’s most consistently successful family-owned businesses. The company is more than 60 years old and employs over 500 people in twelve locations across UK. 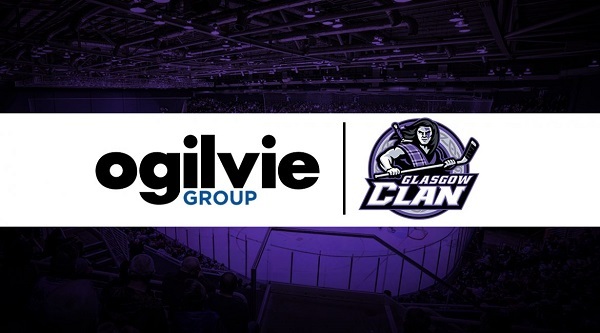 The Glasgow Clan are delighted to announce the return of Ogilvie as a major club sponsor for the 2018/19 season. The partnership will once again see the Ogilvie branding appear on the ice at Braehead Arena as well as being the official player sponsor of Swedish forward Gerard Hanson. Nick Hardy, Sales & Marketing Director at Ogilvie said: “Ogilvie are of course delighted to be once again sponsoring the Glasgow Clan. We’ve had a fantastic relationship for a number of years now and have our own growing Clan fanbase from our Head Office in Stirling. “The branding we have with the club and around the ice helps raise our various Group company profiles in the region in a way that is harder to achieve elsewhere in sports marketing, and also compliments the other relationships we have with a number of other Elite League clubs. “To say the least we have a fair bit of friendly rivalry within Ogilvie and our fans from Glasgow, Belfast and Sheffield. All in good spirit of course….but nobody ever wants to lose. We hope the Clan have a great season and are thrilled to be alongside again this year”. Ogilvie Construction is showcasing the artistic talents of the children at Clepington Primary School in Dundee who drew pictures of their dream house for the nearby new build project in Eliza Street. Children at the school sent in the drawings in a competition run by the construction company, who are building 40 new homes near the school for Hillcrest Housing Association. Now all of the drawings have been collated by the company and made into poster collages displayed on the hoardings at the building site. The company also presented Clepington Primary Head Teacher, Paula Cheghall, with large posters of the collages for display in the school.